President Trump has refused to recertify the Iran nuclear deal, calling it "one of the worst" and most "one-sided" agreements America has ever entered in to. The landmark Obama-brokered deal limited Iran's nuclear capability in return for the lifting of some sanctions. Mr Trump savaged Iran's "rogue regime" in a speech at the White House, in which he also imposed extra sanctions on the country's Islamic Revolutionary Guard. He blamed Iran for spreading "death, destruction and chaos all around the world" and said it had committed multiple infringements of the deal. Mr Trump's decision does not mean the pact will be scrapped - instead it will be forwarded to the US Congress. It will then have 60 days to decide whether to reimpose sanctions or modify the laws on America's involvement in the pact, known as the Joint Comprehensive Plan of Action (JCPoA). 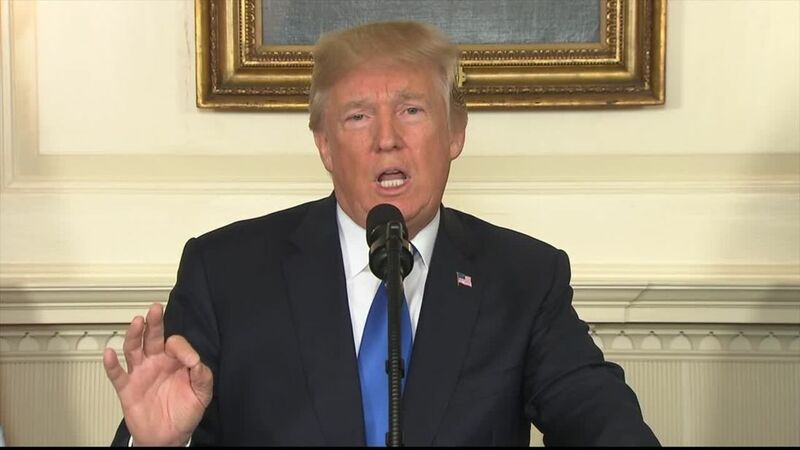 "We will not continue down a path whose predictable conclusion is more violence more terror and the very real threat of Iran's nuclear breakout," said President Trump. He said the deal had "many flaws" and warned: "If we are not able to reach a solution working with Congress and our allies, then the agreement will be terminated". The President also used his speech to criticise Iran's non-nuclear activities, such as its ballistic missile programme, and said it had supported Syria's President Assad and Lebanon's Hezbollah. Mr Trump said Iran-backed attacks had killed many Americans over the years, and that the country had "harboured terrorists" after the 9/11 attacks.